Sweater weather has arrived but this week it became so cold almost overnight! I love all the gorgeous, colorful foliage and walking through the leaves on the grounds. I had the pleasure of hosting another private shopping party with my coworkers Tuesday night at my favorite local LOFT store located in the Prudential Center. If you’re interested in hosting a private event please check with your store to schedule a date and time with your girlfriends. I highly recommend it for a fun bonding experience and to refresh your wardrobe at a great price! Attendees receive an additional discount on top of all current in-store promotions. Get 50% off select styles, sweaters and an extra 50% off sale styles at LOFT. Since no code is needed online you can use the stackable code INSIDER464 online for an additional $25 off qualifying full-price promotional purchases of $100+ (excludes Lou & Grey items). 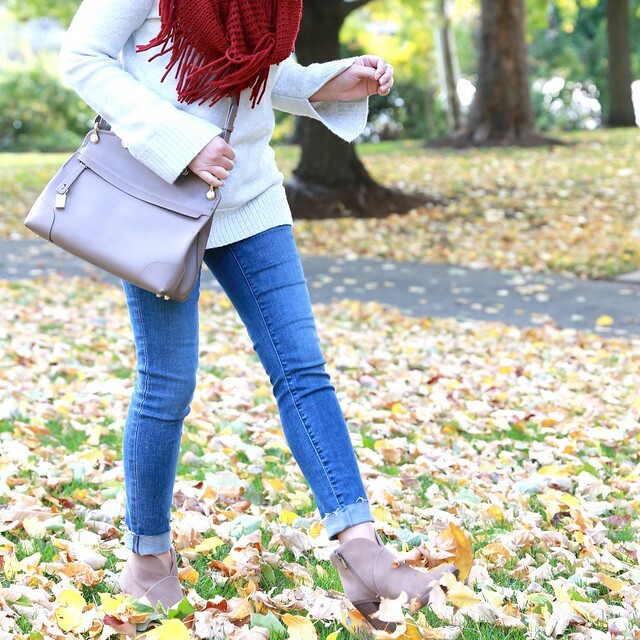 My favorite jeans (review here) are part of this sale! 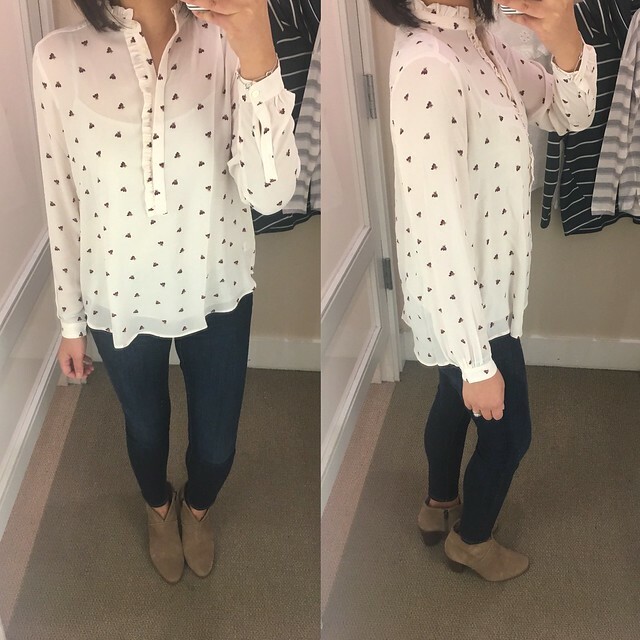 The frayed pair I wore at the top of this post is now on sale an an extra 50% off! 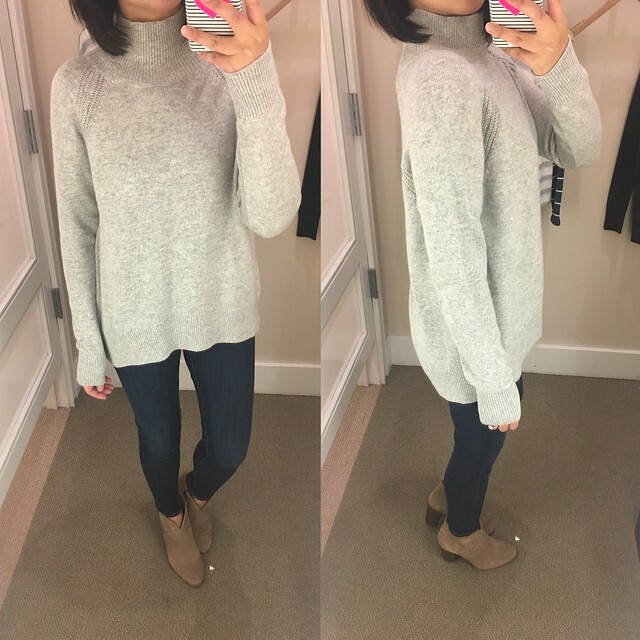 This mockneck sweater was selling out fast since I couldn’t find size XS regular to try. 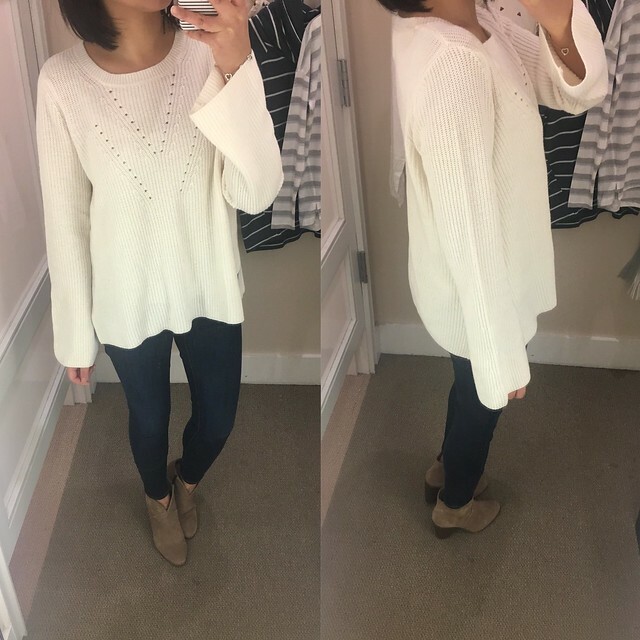 I tried on size S and I was surprised to find that I liked the fit on me. I like wearing the sleeves a bit longer to keep my hands warm. I’d say this sweater fits true to size but I prefer an oversized fit for a longer overall length. I also liked this ribbed bell sleeve sweater but it runs one size bigger. You can stay with your usual size if you like an oversized fit or size down if you want a more fitted look. 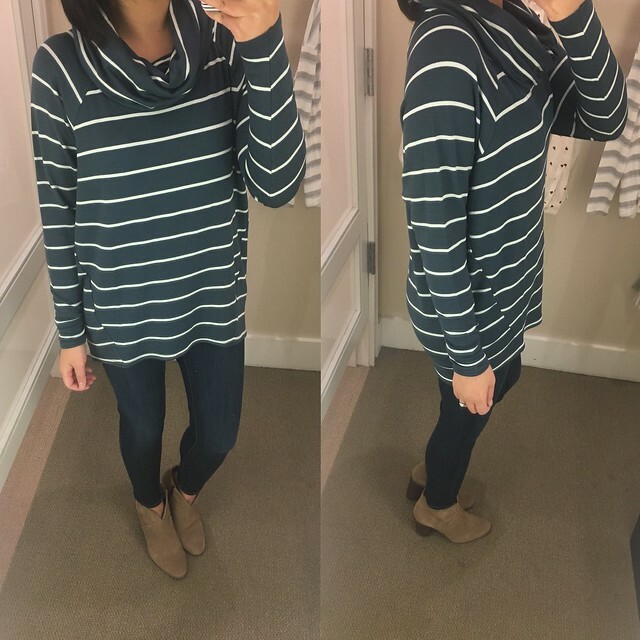 I really liked this signaturesoft cowl tunic since it’s really soft but I wasn’t able to find it online last night since it’s a new arrival that just became available online today. I wanted to get it during the shopping party but I wanted to know if it came in any other colors before committing to it. I also have a similar Lou & Grey sweater last year and I haven’t yet taken out all my clothes from under our under the bed storage. I love the softness and muted colors of this drop shoulder tee. I took home size XS regular which has a relaxed fit on me throughout the body but I didn’t want the sleeves to be too snug. I’d say this tee fits true to size. 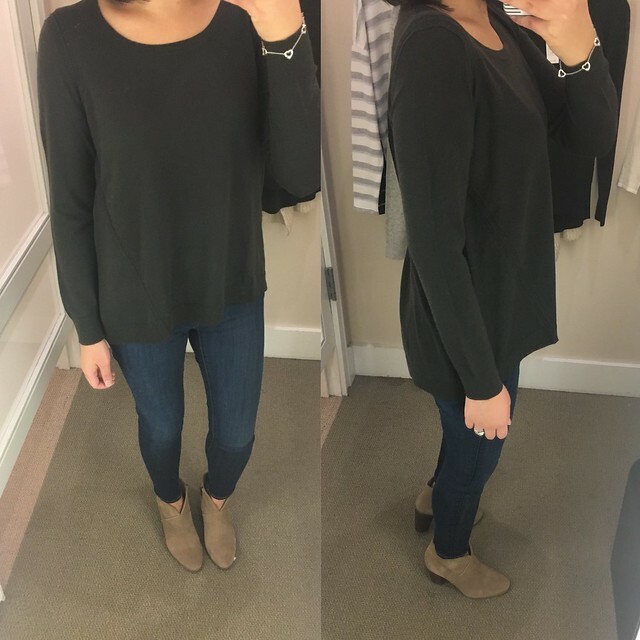 I tried on size XS and S regular of this stitched tunic sweater and decided to go with size MP. The round neckline is a bit lower and loose fitting and I found the petite neckline to lay the best on me. It’s a very relaxed fit so this thin sweater is not for you if you prefer a more fitted look. I’d say this sweater fits true to size but as usual I sized up to avoid overly snug sleeves and for a slightly longer overall length. 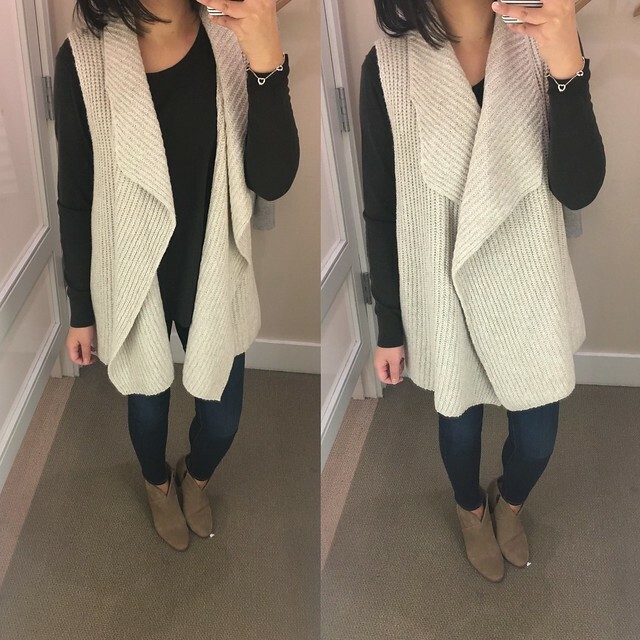 I happened to find this ribbed sweater vest in a few sizes hidden behind the racks. I completely missed it during my first sweep of the store but I’m glad I came across size S to try. I would prefer size XS regular but the size was sold out online and I really wanted to be able to get and wear the vest asap. 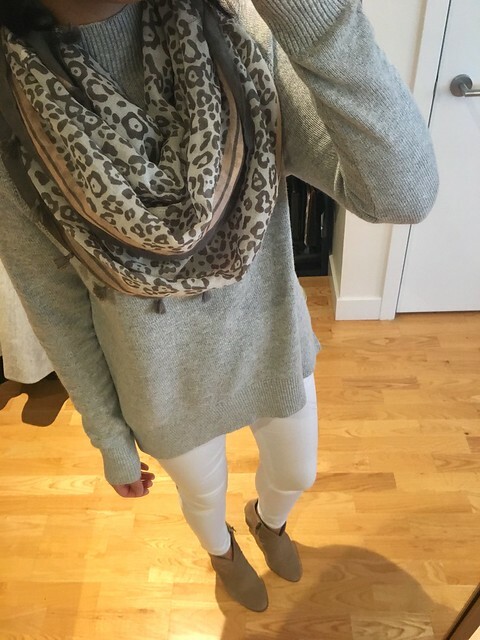 It’s the perfect layering piece over anything from long sleeves to dresses due to the neutral oatmeal color. 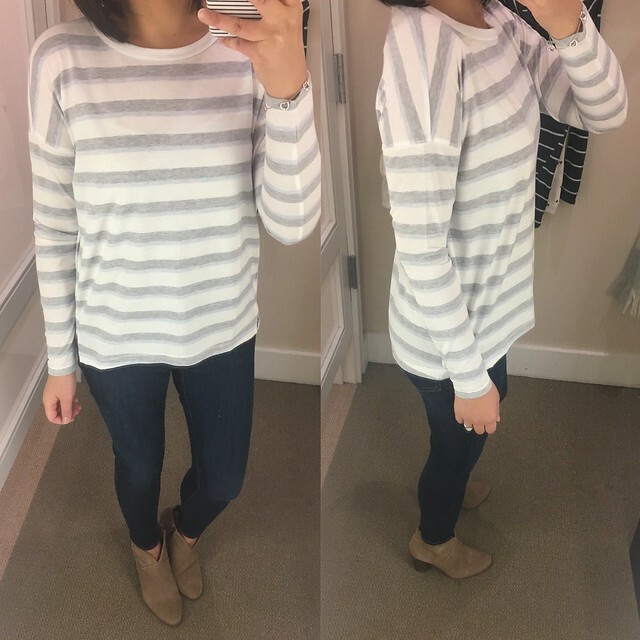 This sweater has a very flattering drape and I found that it runs true to size. However, if I come across a smaller size later then I can give size S to my sister. 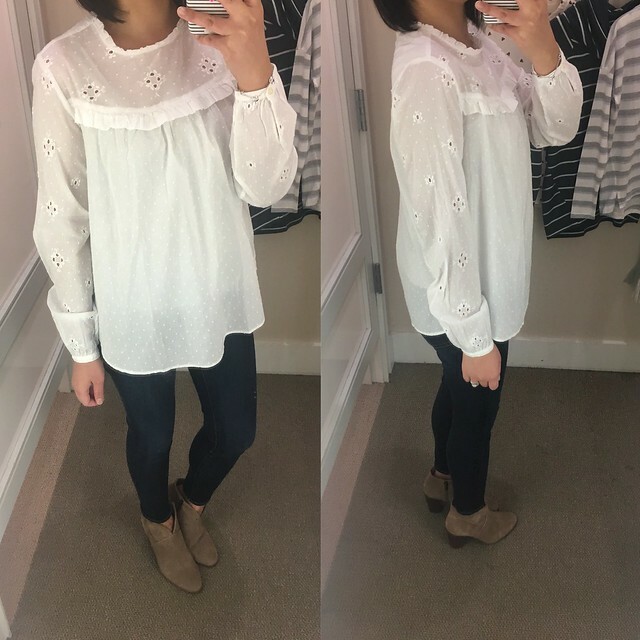 This eyelet shirt was really adorable and I tried on size XS regular for size sine they didn’t have it in petites. It runs really bit and voluminous so I would suggest going down one size. The cute blossom print on this ruffle henley blouse caught my eye but as precious as this blouse is I didn’t love how it looked on me. I need it in size XXS regular which is sold out. It has a very flowy fit through the bodice. It’s also very sheer so a layering cami is required. Lastly, I tried on the buffalo plaid poncho as seen in this clip. It fits more like a large blanket scarf with pockets than an actual poncho. I love the light blue color and the fact that it has pockets. The material is also very cozy and the best part is the pockets for your hands.